In 1837, an abolitionist publisher named Elijah Lovejoy was murdered by a pro-slavery mob in Alton, Illinois. Lovejoy had published his anti-slavery newspaper, the Alton Observer, and a companion paper in St. Louis, since the early 1830s, and his writing had enraged opponents both in Illinois and in Missouri, where slavery remained legal. That fall, Lovejoy was murdered and his printing press dumped into the Mississippi. The mob thought they had silenced the voice of abolitionism in the region, but they were mistaken. Instead, the martyred Elijah Lovejoy and his cause would be replaced by his brother, Rep. Owen Lovejoy (R-Princeton). Owen Lovejoy assisted his brother with his newspaper early on, and when Elijah was murdered, he and his surviving brother Joseph helped to publish Elijah’s memoirs along with the Anti-Slavery Society. When Owen moved north, to Princeton a year later, he continued the cause by helping coordinate the Underground Railroad in the region, the clandestine route to Canada and freedom for escaping slaves. 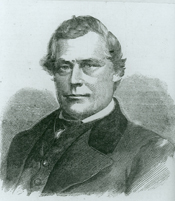 By the 1840s, Owen Lovejoy, ordained a minister in the Congregational Church, was such a force in the Underground Railroad movement, that a section of the route near his home was informally known as the “Lovejoy Line.” He sought to inspire others by his example, letting it be known far and wide that he was assisting fugitive slaves as a way of trying to recruit others to the cause. In 1850, Congress passed the Fugitive Slave Act, part of the Compromise of 1850 which, supporters hoped, would prevent Civil War by placating southern fears of slave rebellion or emancipation. The law, in part, made it a crime to assist an escaped slave anywhere in the country, including the free states of the north. Furious, Lovejoy decided that local activism was not enough, and began running for the legislature. Unsuccessful twice, he was finally elected to office, first to the Illinois House in 1854, and then to Congress in 1856. Before leaving for Washington, however, there was another matter to tend to back in Illinois. With the Whig Party collapsing, there was no committed anti-slavery party in the state. The 1854 Kansas-Nebraska Act, which was spreading slavery into the territories of the west, was a galvanizing moment for the anti-slavery movement, and it inspired like-minded political leaders from across Illinois to come together in Bloomington in May 1856. It was here that Lovejoy along with 270 delegates such as Sen. John Palmer (R-Collinsville) and former Congressman Abraham Lincoln (R-Springfield) helped unify the anti-slavery political factions into the Republican Party. Lovejoy was buried in Oakland Cemetery in Princeton. His family continued to live in the house that had doubled as a station on the Underground Railroad. In 1972, the house, now owned by the City of Princeton, was made into a museum as part of the Owen Lovejoy homestead. Today, the homestead is a National Historic Landmark, where its history as part of the Underground Railroad is preserved for future generations.